A community tornado safe room is defined as a shelter capable of protecting a large number of people from the destructive forces of a severe weather event. The sizes, configurations, and locations of community tornado safe rooms constructed using the Remagen Safe Room System are limited only by the imagination of the customer. RemagenSafeRooms has engineered many community tornado safe rooms to meet customers’ needs for custom-configured shelters, within and connected to host buildings, as standalone shelters, and as tornado safe rooms retrofitted into the corridors of several middle schools. Configured so as not to change the architecture or function of the customer’s facility, our safe room designs meet the requirements of ICC 500 – 2014, ICC/NSSA Standard for the Design and Construction of Storm Shelters and FEMA P361 – 361, Design and Construction Guidance for Community Safe Rooms for 250 mph EF-5 tornadoes. All RemagenSafeRooms tornado shelter components have been tested for tornado debris impact resistance by a certified testing facility. 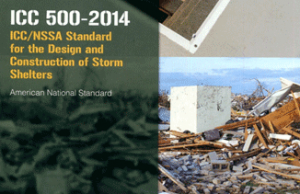 RemagenSafeRooms is a founding Producer Member of the National Storm Shelter Association (www.NSSA.cc). ICC 500 defines community shelters as those serving more than 16 occupants or serving occupants of other than of dwelling units. The Remagen Safe Room System is used to harden schools, emergency operations centers, police and fire stations, 911 facilities, daycare facilities, hospitals, nursing homes, and office buildings. Community tornado safe rooms provide protection to a company’s customers as well as its employees. Having consideration of their safety and peace of mind is greatly appreciated by both groups. With a Remagen Safe Room System Retrofit Safe Room, building occupants have safe and direct access to a high quality tornado shelter for protection against the destructive forces of severe weather. The features and benefits of each type of Remagen Community Safe Room System will be described separately by photos depicting unique features of each type in the links below.